For this project working with Laura K we customized a theme and adapted it to the marketing and business goals of Imaginis Business Developement. Blogging on a subjects of interest to their clients such as Branding, Budgeting, Market Planning, Sales and Marketing and Social Media on their Word of Mouth blog, WordPress is a perfect platform. 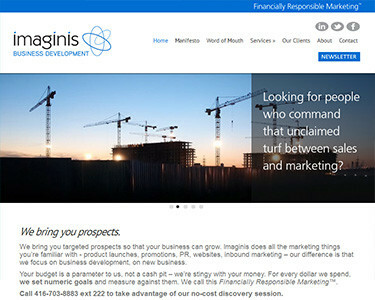 Imaginis is a Toronto-based business development company focused on strategic marketing and sales activities. They specialize in customer engagement techniques that deliver measureable results. Working with Melanie Dowhaniuk and Sean Cotnam was a a pleasureable exprience and we are looking forward to working with them on projects in the near future.